NFL Draft day is finally here. 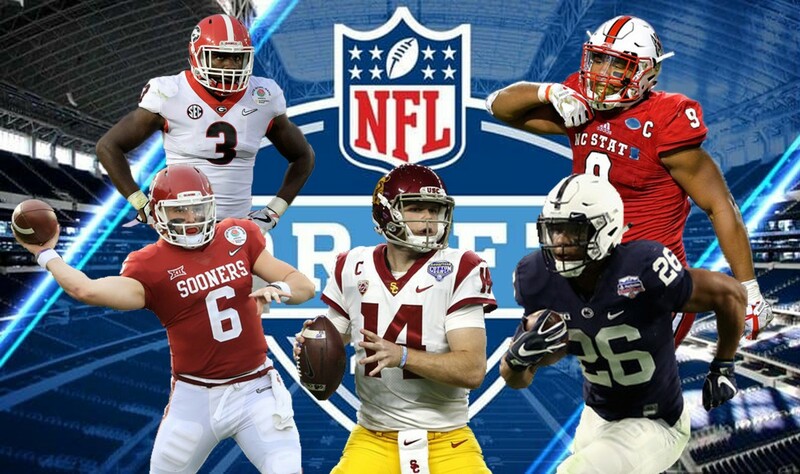 The 2018 NFL Draft kicks off its 83rd edition with round one tonight at 8 p.m. ET. The Draft is taking place at AT&T Stadium in Dallas, home of the Cowboys. The first three picks are in: Cleveland Browns select Baker Mayfield, the New York Giants select Saquon Barkley and the New York Jets select Sam Darnold. With the sixth pick in the 2018 NFL Draft, the Indianapolis Colts select Quenton Nelson, guard out of Notre Dame. The Tampa Bay Bucs have traded the seventh overall selection to the Buffalo Bills. The Buffalo Bills select Josh Allen, QB, Wyoming. We’ve drafted Josh Allen with the 7th overall pick. This is a wise move for Buffalo. In Allen, they have maybe the strongest arm in the NFL Draft. Tampa Bay will receive the 12, 53 and 56 overall picks. Buffalo received a seventh round pick (255th overall). With the eighth pick in the 2018 NFL Draft, the Chicago Bears select Roquan Smith, linebacker out of Georgia. Picks 9 and 10: The San Francisco 49ers select Mike McGlinchey out of Notre Dame. The Arizona Cardinals have traded up to the number 10th pick and selected Josh Rosen, QB, UCLA. Happy to have you, @VitaVea! The defensive line in Tampa is stacked. Vea, Gerald McCoy and Vinny Curry! that is going to be tough to defend against. The New Orleans Saints have traded the 27th, 147th and their 1st-round pick next year to the Green Bay Packers for they No. 14th overall selection. Once again, the Buffalo Bills have traded up. With the 16th pick in the 2018 NFL Draft, the Buffalo Bills select LB Tremaine Edmunds, Virginia Tech. With the 17th overall pick, the Los Angeles Chargers select Derwin James, safety, Florida State. The Green Bay Packers have moved up, the Seattle Seahawks trade down. We have traded WR Martavis Bryant to the Raiders for their third round pick (75th overall). "I mean there is a lot to live up to and I am going to do just that and more." - Vander Esch. With the 21st pick in the 2018 NFL Draft, the Cincinnati #Bengals select Billy Price, center from Ohio State. Our defense just got that much better. Welcome to Tennessee, Rashaan Evans (@616evans4)! 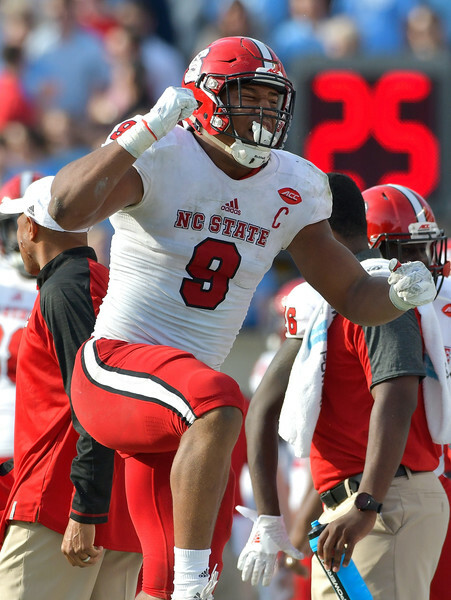 With the 24th pick in the 2018 NFL Draft, the CarolinaPanthers select WR D.J. Moore out of Maryland. The Ravens offense works a lot better when they have a big, pass catching tight end to work with. Hurst should really go well with the wide receivers the Ravens added in the offseason. What a pick. Ridley is considered the best wide receiver in this draft class. Worked well when Amari Cooper was the number one at Bama. Will learn from one of the best receivers in the NFL. With the 27th pick, the Seattle Seahawks select Rashaad Penny, running back, San Diego State. With the 28th pick, the Pittsburg Steelers select Terrell Edmunds, safety out of Virginia Tech. With the 29th pick, the Jacksonville Jaguars select Taven Bryan, defensive tackle, Florida. With the 30th pick in the 2018 NFL Draft, the Minnesota Vikings select Mike Hughes, defensive back from UCF. With the 31st pick in the 2018 NFL Draft, the New England Patriots select Sony, Michel, running back from Georgia. The Baltimore Ravens have made a trade to get back into the first round. We have traded for No. 32 from the Eagles. With the 32nd pick in the NFL Draft, the Baltimore Ravens have selected QB Lamar Jackson out of Louisville. The first round of the draft started with a Heisman Trophy winner be selected (Mayfield, 2017) and ends with Trophy winner (Jackson, 2016) being selected. It is only the third time ever that five quarterbacks were taken in the first round and it is the first time that two brothers were selected in the first round in the same draft.